As late Victorian society gradually opened its doors to self-made millionaires, Americans, politicians, and artists, the art of conversation grew in importance. The quickest way to get doors slammed in your face was to be rude or a bore, and women striving to enter choice circles could find themselves cut by society matrons if their voice and manner were too pushy or too loud. Also, since the popular indoor amusements of Victorians and Edwardians were word games, recitations, and monologues, the tongue-tied were at an extreme disadvantage. The best answer to the question, “What should guests at dinner talk about?” is, anything and everything, provided the talk is tinctured with tact, discretion, and discrimination. To one’s dinner-companion, if he happens to be a familiar acquaintance, one can even forget to taboo dress, disease, and domestics. One might likewise, with discretion, set at liberty the usually forbidden talk of “shop,” on condition that such intimate conversation is to one’s dinner-companion alone and is not dragged into the general flights of the table-talk. While one talks to one’s dinner-companion in a low voice, however, it needs nice discrimination not to seem to talk under one’s breath, or to say anything to a left-hand neighbor which would not be appropriate for a right-hand neighbor to hear. When in general talk, the habit some supposedly well-bred persons have of glancing furtively at any one guest to interrogate telepathically another’s opinion of some remark is bad taste beyond the power of Censure or the possibility of forgiveness. At large, formal dinners, on the order of banquets, it would be impossible for all guests to include a host or hostess in their conversational groups from any and every part of the table; only those guests seated near them can do this. But at small, informal dinners all guests should, whenever possible, consider it their duty to direct much of their conversation to their host and hostess. I have seen guests at small dinners of no more than six or eight covers go through the various courses of a three hours’ dining, ignoring their host and hostess in the entire table-talk, while conversing volubly with others. There is something more due a host and hostess than mere greetings on entering and leave-takings on departing. If the dinner-party is so large that all guests cannot show them at the table the attention due them, the delinquent ones can at least seek an opportunity in the drawing-room, after guests have left the dining-room, to pay their host and hostess the proper courtesy. Hosts should never be made to feel that it is to their cook they owe their distinction, and to their table alone that guests pay visits. 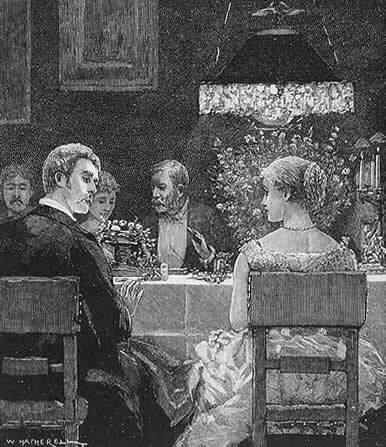 To say that the dominant note in table-talk should be light and humorous is going too far; but conversation between dinner-companions should tend strongly to the humorous, to the light, to the small change of ideas. There should be an adroit intermixing of light and serious talk. Thoughtful dinner-guests take pains not to monopolize the conversation. They bring others of the company into their talk, giving them opportunities of talking in their turn, and listening themselves while they do so: “You, Mr. Brown, will agree with me in this”; or, “Mr. Black, you have had more experience in such cases than I have; what is your opinion?” The perfection of this quality of conversational charm consists in that rare gift, the art of drawing others out, and is as valuable and graceful in guests as in hosts. The French have some dinner-table conventions which to us seem strange. At any small dining of eight or ten people the talk is always supposed to be general. The person who would try to begin a tete-a-tete conversation with the guest sitting next to him at table would soon find out his mistake. General conversation is as much a part of the repast as the viands; and wo to the unwary mortals who, tempted by short distances, start to chatter among themselves. A diner-out must be able to hold his own in a conversation in which all sorts of distant, as well as near, contributors take part. Of course, this implies small dinners; but English-speaking people, even in small gatherings, do not attempt general conversation to such an extent. They consider it a difficult matter to accomplish the diagonal feat of addressing guests at too great a distance. Dinner-companions, however, should be alert to others of the conversational group. A guest can as easily lead the talk into general paths as can a host or hostess. Indeed, it is gracious for him to do this, tho it is not his duty. The duty lies entirely with a host or hostess. At any time through the dinner a guest can help to make conversation general: If some one has just told in a low voice, to a right-hand or left-hand neighbor alone, some clever impersonal thing, or a good anecdote, or some interesting happening suitable to general table-talk, the guest can get the attention of all present by addressing some one at the furthest point of the table from him. The dining-room is both an arena in which talkers fight with words upon a field of white damask, and a love-feast of discussion. If guests are neither hatefully disputatious, nor hypocritically humble, if they are generous, frank, natural, and wholly honest in word and mind, the impression they make cannot help being agreeable. I have seen French cartoons in particular from 1900 where guests at a dinner party jump all over the table to hit other guests on their heads. Presumably they didn’t like their fellow guests’ politics. @Hels: Those still apply to today, I think. 😉 As for the French, they weren’t shy about speaking their minds! I’ve read that during the 1890s, at the height of the Dreyfuss Affair, people regularly–and publicly–fell out with friends and family members who were on the opposing side of the scandal.